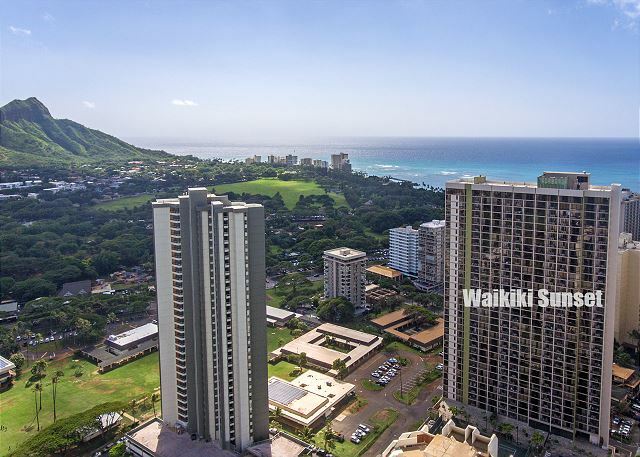 Waikiki Sunset #1004 - Ocean views - 1 bedroom, AC, WiFi, pool, parking. Close to beach. Sleeps 4. Interior renovations are scheduled for 10th floor hotel-owned condos from May 31-June 27, 2019 (not #1004). The 10th floor hallway will be covered with plastic sheeting and there may be noise/dust coming from these units. Nightly rates for this period will include a 10% discount to compensate for any inconvenience. You'll appreciate this well-priced, one-bedroom condo where pride of ownership shows! This one-bedroom condo (564 sq.ft. plus lanai with table and chairs) has partial ocean and Diamond Head views and central AC. - A mirrored wall reflects partial ocean view from kitchen and living room; you’ll see Diamond Head from the lanai and bedroom! 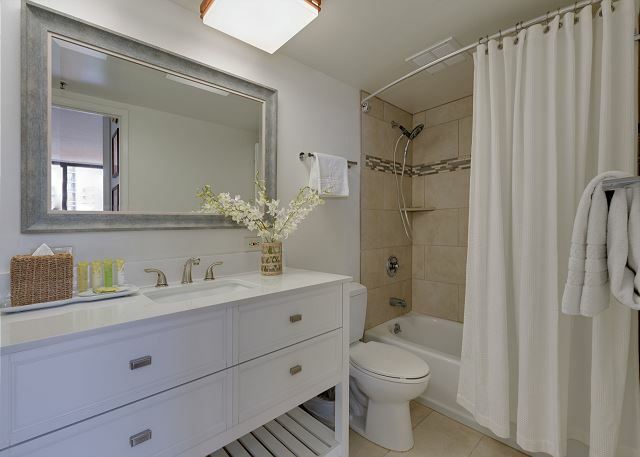 - Remodeled with NEW vanity, Ceramic Flooring, new Tub and new fixtures! Coin-op laundry facilities located on each floor. This non-smoking accommodation sleeps 4. An on-site sundry store offers beach equipment rental. Public transportation at corner. Great location & ocean view! Convenient to beach & restaurants! We really enjoyed the location and ease of this condo! It was clean and had everything we needed! Nice to have a kitchen & balcony to chill out on! I would highly recommend this property and would stay there again! 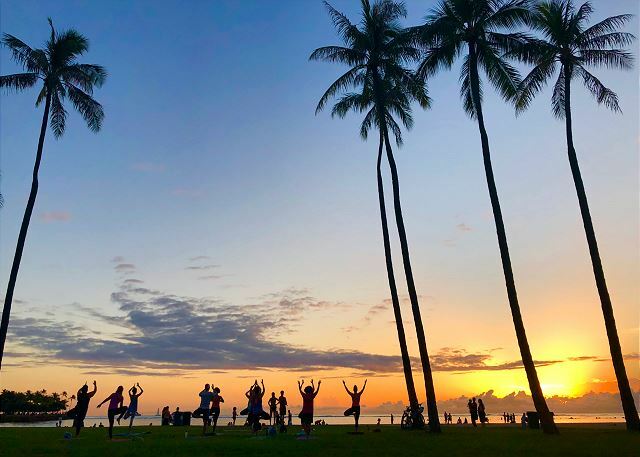 Mahalo, Lisa, for the lovely review! We're so glad you enjoyed your stay and pleased that you took advantage of the balcony and ocean views of this fabulous condo! 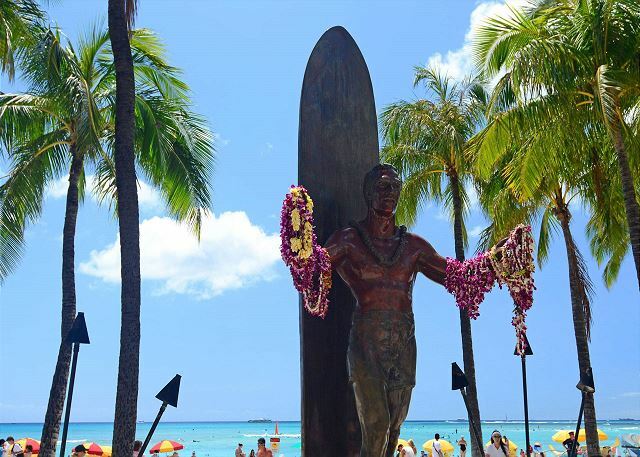 We look forward to welcoming you back on your next visit to Waikiki! good location, 3 blocks from the beach. The area seemed ok, and security on site. The unit was large enough and nicely appointed. Very comfy bed and a decent pullout couch. Full sized bathroom and having some beach stuff(chairs, snorkels etc was a great bonus. Check-in and follow-up from the agent was very good and having a parking pass was excellent. Aloha Silas! Thanks so much for taking the time to post a review about your experience at Waikiki Sunset. Happy to have provided all of the needs you required for a wonderful vacation in this great condo! Even when on vacation, accidents can and do happen. Most Vacation Rental Hosts charge some type of security deposit as insurance, in case damages are incurred during a guest's stay. We appreciate the feedback and will look forward to your next visit! Mahalo, Amy! We appreciate the 5 star review and great feedback! We will look forward to your visit next year! CAPTAIN COOKS RENTALS WERE AWESOME. I LOVED THE FACT THAT THEY HAD A TOUCH KEY PAD, FREE PARKING, GREAT SERVICE, AFFORDABLE RATES, AND A QUICK WALK TO THE BEACH. THE CONDO OFFERED EVERYTHING WE NEEDED FOR OUR STAY. I WISH THAT THEY COULD PROVIDE A PLACE FOR US IN MAUI FOR NEXT YEAR. I RECCOMMEND CAPTAIN COOK TO EVERYONE. WHEN I COME BACK TO WAIKIKI. IM USING THEM AGAIN. LOVED IT! The property was very well maintained and well located. We particularly like the porch which gave a pretty nice view of the mountains and the water. There is a run down looking building right next door but if you don't look directly down it is fine. The lobby itself is a little tired (and the elevators kept breaking down) but it didn't affect our stay. We could walk to the beach and a lot of restaurants. The unit was very well stocked and had everything we could need. The furnishings were clean and comfortable. The management company was very responsible. 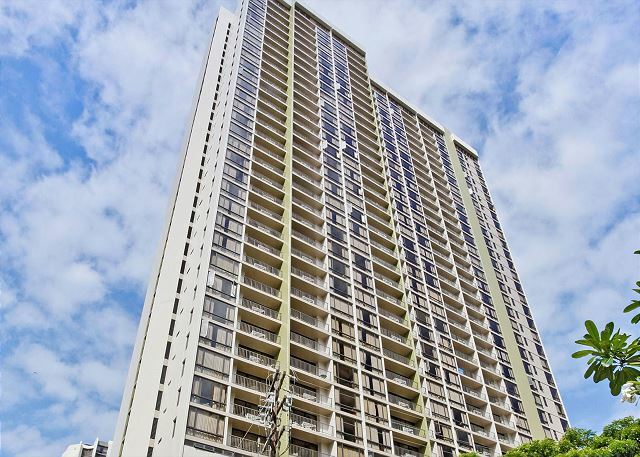 Very pleased with this Condo, good location, walking distance to Waikiki Beach. well maintance,clean,well stocked kitchen. and items for the beach.Would highly recommand. Mahalo for the great review and recommendation! We are pleased your stay was enjoyable and you appreciated the great location of this wonderful condo! We look forward to seeing you again on your next visit! - Free beach chairs, umbrella, beach towels, boogie boards, and beach mats to use. - Double glazed windows so no road noise. - Laundromat on each floor - however couldn't download app to pay for as only allowed on US sim cards. was $1.50 and only accepts quarters. - Lighting not great - no roof lighting, only lamps which didn't really provide a great deal of lighting, especially in the bedroom. No easy switch for lounge area lights - had to use lamp directly. - Kitchen has zero condiments (no salt, pepper, sauce, oil for cooking, washing powder, etc). Did have a starter tea and coffee kit. Overall was a great experience. No "woman's touch" to apartment to make it homely. For the price, it was what we expected. However, if we were to do it again, we would probably pay a bit extra for something a little bit more polished. 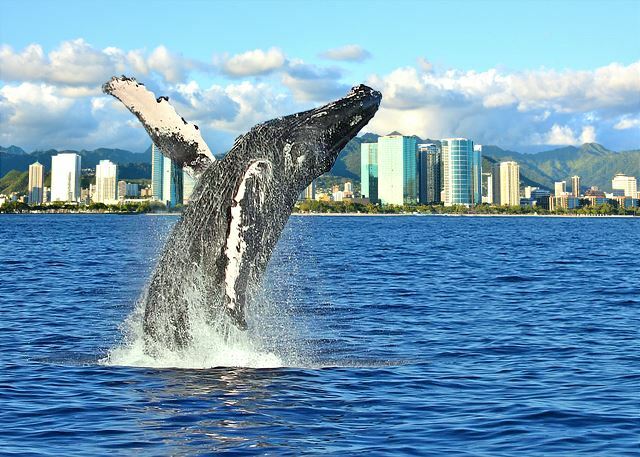 Mahalo for posting a detailed review and recommendation of your recent stay! We're delighted your Holiday visit was enjoyable! Thank you for your input on the lighting I will pass your feedback onto the team. We look forward to your next visit! I stayed here for a week with my wife and 18-month old child. 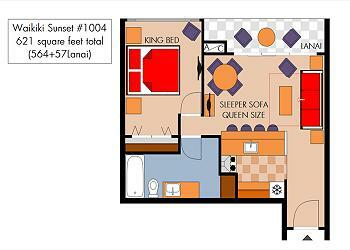 I really like this unit, which has upgraded appliances, a very comfortable king bed, and CENTRAL A/C. There are plenty of pots and pans and plates for cooking, so we were able to invite friends over for dinner, which was great. The unit has some nice beach gear (chairs, umbrella, etc.) available for use. The 6th floor has a pool and bbq area. Byron checked us in and was responsive to our phone calls. We did have an issue with the bathroom on check-in, which had a clogged toilet and clogged bathtub drain, but I was able to unclog the toilet myself and Byron came by the second day to clean out the bathtub drain. Also there is a small leak from the shower head that needs to be fixed. Thank you very much for taking the time to send us detailed positive comments. We work hard to offer great accommodations and service, and we're so glad your visit was enjoyable. I will pass your feedback onto the team, and we look forward to your next visit! We had a very enjoyable stay at Waikiki Sunset 1004. The condo is in perfect location. Close to everything, well maintained, clean and quite. 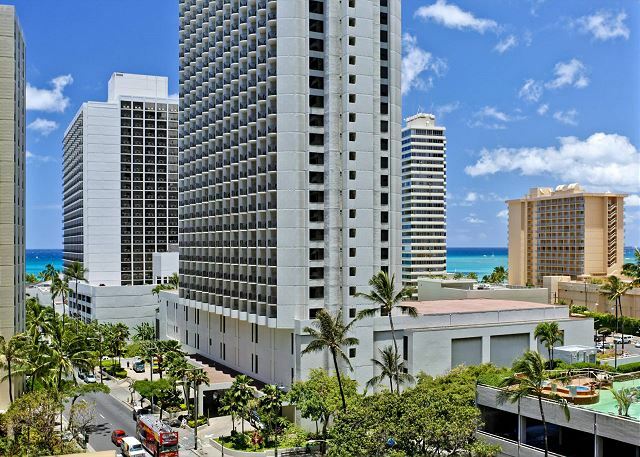 Good value, great location to Waikiki Beach and shopping. Unit wasn't huge but adequate and comfortable for 2 people. All kitchen appliances, dishes, and utensils were available. Linen and towels were sufficient. Beach chairs were available and a plus. Aloha Bart! Thanks so much for leaving such a great review about your recent stay. Happy you appreciated the beach chairs. Hope you can enjoy a return trip to our beautiful islands soon! I've stayed in the Waikiki Sunset many times. The rental unit I was in on this trip was very well equipped, clean, quiet and also had a nice view. The representatives from Captain Cook that I dealt with were all quite helpful. All in all, it was what I look for in a vacation rental experience. I will be contacting Captain Cook again when I next return to Waikiki. Excellent place to stay! The property's condition is slightly more dated than the pictures show, but everything is clean and comfortable. Location is great and easy free parking is a bonus. I saw a lot of reviews about the slow elevators, but I didn't find them too bad. There are 4 elevators that service the building. From the Lobby they are usually available right away. The property manager was very responsive to all my inquiries. Thanks for a great stay! Mahalo, Richard, for taking the time to share your recent experience at Waikiki Sunset #1004! It's always great to get this kind of feedback - we're so glad you enjoyed your stay! We hope you’re able to return for another visit soon! The unit was in a great location, updated kitchen, easy to access, easy parking, as advertised. 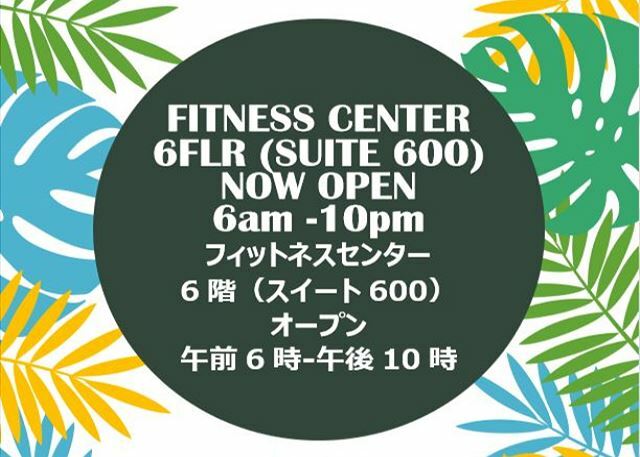 Was a great bargain, and when I go to Honolulu again, I will try to stay in the unit again. We stayed at this location back in June and have not received our deposited back. Mahalo for the great review, Steven! The $300 you paid when you made the reservation is payment toward the reservation in full and not a refundable deposit. As the website states, the $300 is "applied toward the balance." We apologize for your misunderstanding. Captain Cook Real Estate agent was very professional and attended to our every need. We would rent through Captain Cook again. The rental unit was adequate with all of the kitchen equipment needed for your stay. The bathroom electrical outlets needed reset and the door needed something to stop it from closing all the time. The building is definitely older but well kept up. The four elevators on each floor take a long time to arrive because of the number of floors. Always found a parking place on the third level of the garage. The parking attendant woman is not the most friendly person to deal with or ask questions of. Mahalo, James! Hope you are able to visit again soon! Had no complaints with the room. First night air bed went flat so we rung Property manager who had it replaced with a brand new one pronto. Only complaint would be the lifts in the building are so SLOW. Would rent and recommend happily. Mahalo, Geoff! We'll look forward to your next visit! My husband and I really enjoyed our stay at this super comfortable unit! The location was great and the management team did an excellent job of taking care of us. We tried to extend our stay, but the unit was already booked by someone else - no wonder why as it is a lovely property. Mahalo, Yvette! What a great review! We appreciate your feedback - and the recommendation! Give us a ring when you're ready to plan a return visit! My 2 kids and I really enjoyed our stay at this location. 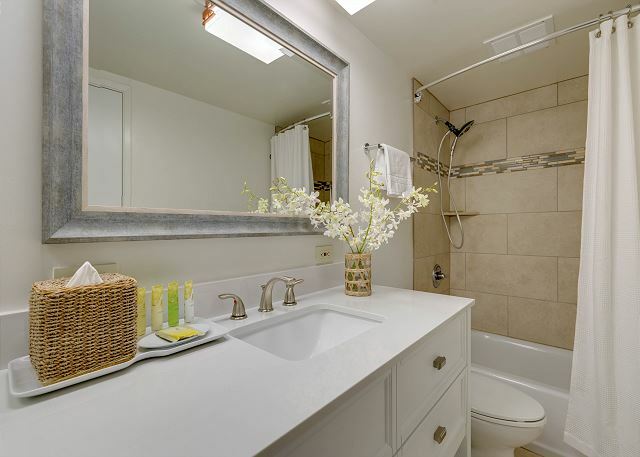 The unit was clean, well maintained and the parking garage was very convenient. We arrived late at night and still had a warm welcome from the team. Thank you very much for our stay! Mahalo, Tiffany! We're glad your family enjoyed their stay! Nice condo, 2 blocks from Waikiki beach. Nice Condo, 2 blocks from the beach. Management was very good in helping us. Everything was has describe on the site. Mahalo, Benoit! Hope you can plan a return trip soon! The condo was just as the listing and photos showed. The bed was very comfortable and the kitchen was well equipped. It was an easy walk to the beach and shops. We had a car and the parking arrangements were great for easy in and out. Mahalo for posting a review of your stay, Mary! We're glad you enjoyed the condo and hope you're able to return for another visit soon! This location is only 3 blocks from the beach towards the end of Waikiki. The place is also only a few blocks from the Zoo. There are many restaurants and shops that are within walking distance. There's an ABC Store on every block so you can pick up essentials. The condo was clean upon arrival and the central AC works great. The condo faces the beach and has a little patio set. The sun shines into the condo in the afternoon but we didn't mind. The parking garage is attached to the building. The living room in the condo is spacious. The TV has a lot of channels. Channel 56 provides a guide but we wish there was a print out telling us the channel list. There's also a DVD player provided. I believe the lobby has a machine where you can rent DVDs. The kitchen is fully stocked with some dish soap, a sponge, small/big trash bags, paper towels, zip lock bags, foil, plates, etc. We were able to cook breakfast every morning which was great. The bedroom has a king bed. There are black-out curtains which is also a plus. The AC is connected between the bedroom and living room so the bedroom gets cooler faster than the living room. There were plenty of hangers provided as well as extra sheets, pillows and blankets in the closet and a vacuum. The bathroom has a full size tub. The bathroom door wouldn't stay open on it's own so we used the garbage can to prop it open. A wall blow dyer and a regular one are provided. Some toilet paper and bar soap was under the sink. The bathroom closet had the following supplies: bath towels, 4 beach towels, 3 beach chairs, a mini hard cooler, 3 bag coolers, bucket and shovel beach toys, laundry basket, broom, etc. There's a mini mart in the building which has a little of everything (food, drinks, alcohol, beach supplies, etc). There is a heated pool and tennis courts in the building as well. Mahalo, Mary, for the thorough and thoroughly wonderful review! We appreciate your feedback! When we arrived, the condo was clean, the onsite manager was very helpful. Parking was free, which was awesome. A little away from Waikiki beach, about a 5 minute walk. Not bad, the plus was it was away from the noise, so sleeping was awesome. Mahalo, Alan, for the great review! We hope you can visit us again sometime soon! Waikiki Sunset was the perfect choice for this trip. Location and condition was great. Short walk to the beach. Fair distance from the shopping district so it wasn't noisy at all. Free parking for the rental car. Very easy access from the highway, ideal for people who plan to drive around and explore the island. Close to the zoo too. Sounds you like you all had a great time on Oahu! Glad we could host your stay and hope you're able to return again soon! The property was very clean. Great location, walk to the beach in five minutes. The bath tub and shower curtain and rod need to be updated. Free parking a definite plus. Glad the property had A/C. Mahalo for taking the time to post a review, Chenita! Thanks for your notes on the shower curtain rod replacement. We are taking care of that right away! Hope you can visit again soon! Wow wow wow! Great place to stay! This place was amazing, spacious, has A/c and Byron the Condo Manager made my experience the best ever. 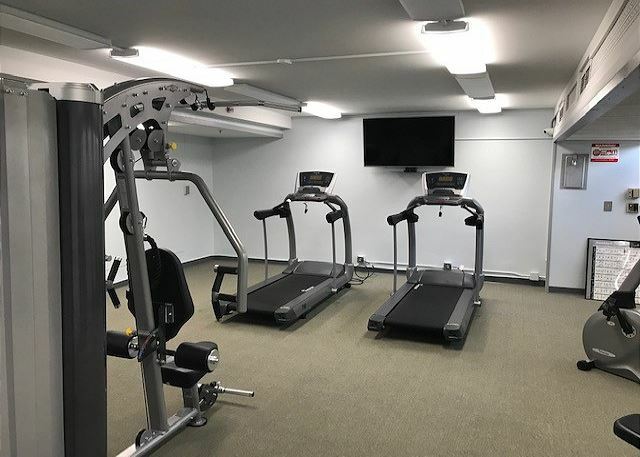 Location- this place is a 5 minute walk to the beach and shopping centers, the Condo has everything needed to cook from condo to save more money. For the price this was the best decision I've made on vacation. Very pleased with condo unit. Clean, quite, good location. Mahalo, Lauri! We hope to see you again! We had a great time in Hawaii and the Condo offered all we needed. Great kitchen with all needed supplies, sleeping sofa and fantastic and comfortable bed, couldn't say a bad word about this room! Room was clean and had all necessities! Pool area was nice but mostly very cold as it was on the 6th floor and it was quite windy most days. Unfortunately the staff from Waikiki Sunset wasn't that friendly at all and we didn't feel welcomed, only due the the reason that we booked a private condo in the complex, which shouldn't make a difference in my eyes, as we still were paying guests and didn't want to have extra favours. All in all, i give the room a thumbs up but the hotel itself just an ok.
Mahalo for the positive comments and recommendation! We work hard to offer great accommodations and service, and we're so glad your stay was enjoyable. We look forward to seeing you on your next visit! Thank you for alerting us to the less than friendly staff from the on-site management company (not us!) Although we have no control over staff at Aston, we certainly apologize for their behavior. The owner of the condo plans on bringing your comments to the attention of the owners association. We look forward to seeing you on your next visit! Building is a bit dated but the suite itself was recently renovated and clean. 3 blocks from wikiki beach, free parking, free wifi, comfortable bed, pool and laundry facility, what more do you need? Property manager was awesome and was willing to accommodate late check-out. Mahalo for the positive comments and recommendation! FYI, Waikiki Sunset has future plans for complete lobby renovation. Lovely unit, would love to stay here again. Two excellent weeks of sun and surf in Waikiki were made perfect by our stay in a lovely condo that served most of our needs. 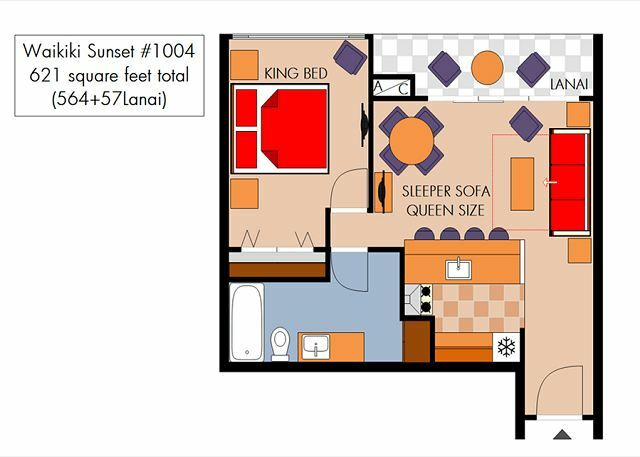 The king-bed was comfortable, the kitchen included all of the usual/expected appliances and utensils, the view from the lanai was super, and we made good use of the TVs (one in the living room & one in the bedroom), the phone and the internet. Parking was a definite plus and so was the easy access to the beach. If available, we will pick this place again on our next trip. Mahalo for the great review and recommendation! So glad you enjoyed your stay and we look forward to your next trip! This was a great experience. It was a super price for what you got. The place was immaculate and has everything you need to be completely comfortable and self sufficient. It is better than the pictures. Unit was very comfortable and one of the most well equipped kitchens we have had while renting condos in Waikiki. We enjoyed our stay in the Condo...the free WI-FI and free parking was very useful!! The Condo had a homely atmosphere and while I am not a fan of eating out every night, grabbing groceries from Safeway (on Kapahulu) came in real handy. Definitely suit a single or couples! unit is need of an update. Kitchen is really cheap looking. Quite a few areas were really sticky and we could not get then clean. Sunset lobby is very cheap looking. View from lanai is good. Ac is loud and keeps you awake. Our family stayed at this condo for a week in early September and had a great time! 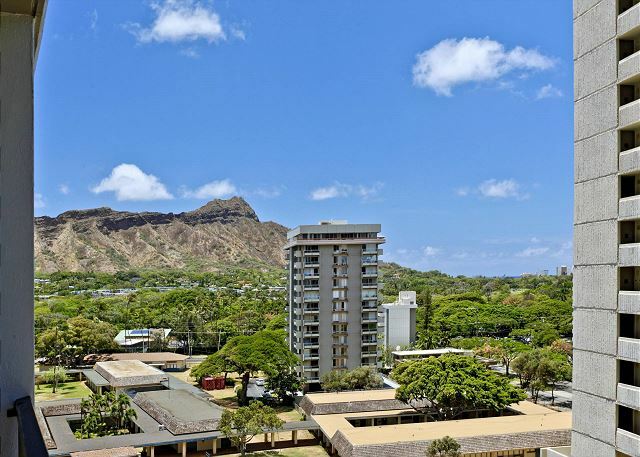 The unit was well priced, and the best part was how close it was to the Waikiki beach. There were some cheaper units in the area, but it would have doubled our walking time to the beach, and I doubt we would have gone as much. The unit was clean, and up to date. It's not fancy, but for a family with small kids, that is not what I was looking for in a place to stay. We wanted something comfortable, within close walking distance to the beach, and this unit delivered! The kitchen had everything we needed in terms of dishes and cooking utensils. We were able to buy groceries and eat our meals in the condo about 70% of the time which saved us quite a bit of money. It is about a 5 minute drive to Safeway, which is also great. The king size bed worked out perfect for us. We have two kids under 4 and they both slept in the bed with us. We found that easier than pulling out the sofa bed every night. It was also nice having the bedroom separate from the living room area so we could put kids to bed at their usual bedtime. Having parking included was very nice. I'm sure it's true with most parking garages like this, but the spaces and area to park is pretty tight so you have to be really careful getting in and out. The spaces can also be limited at times, but we were always able to find a place. Usually it just means walking a little bit further, which was never a big inconvenience. The property manager, Byron, was very nice and helpful in getting us checked in. I also misplaced a key (which was later found) and had to call him for help. I was quite embarrassed and sorry to have to call since this was after 8pm and surely interrupting his evening, but he graciously came out within 10 minutes to get us back into the condo. What service! The room was was exactly as pictured on the website. The kitchen was well equipped. The management was very helpful and provided a lot of information. 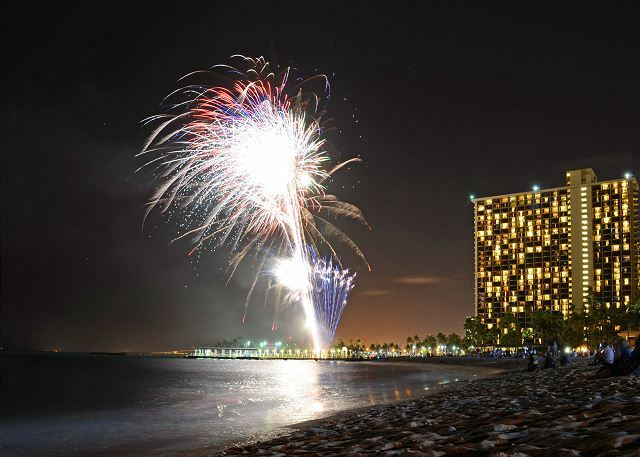 The next time I go to Hawaii I will definately use Captain Cook's to book a condo. We had a great experience dealing with Captain Cook. 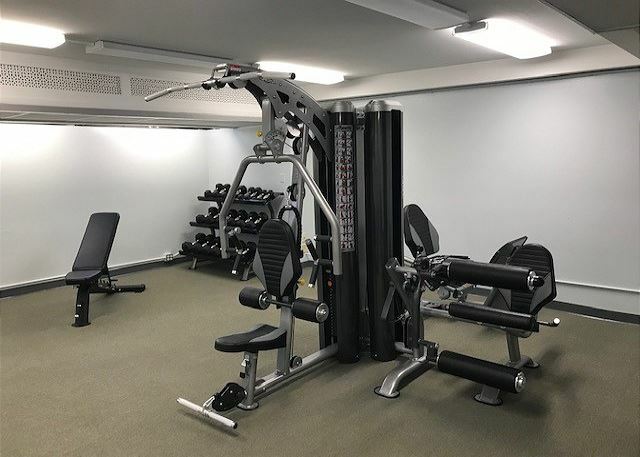 We were very happy with the building, the unit and the service we had. We had a little issue with the phone and garbage disposal and things were looked after immidiately. Also being so near the beach, church and many neat restaraunts was a bonus. The bus at the corner of the street was also a benifit to us sd we use it a lot. I would definately recommend Captain Cook Rentals. The staff at Captain Cook are very professional would recommend them to anyone. This is a great place to stay for two people. 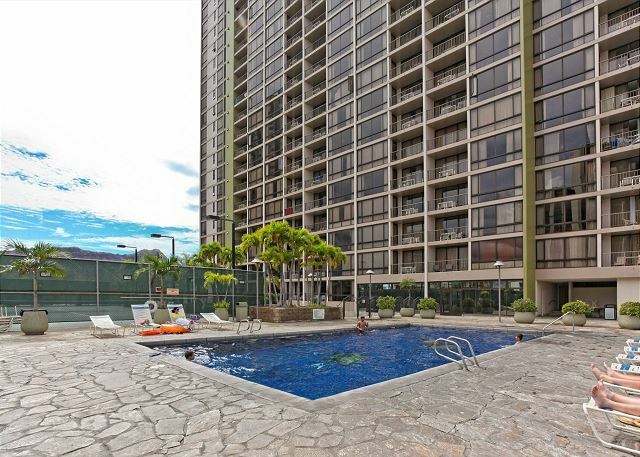 This location makes for very easy access in and out of Waikiki. It is only one block to Waikiki beach. The laundry rooms on each floor are very convenient. The only disappointment with this room was the lack of a dishwasher. The room itself was well stocked, very clean and well kept. We would definitely stay there again. Location was good. I was disappointed there was no dish washer when there was a space left open in the lower cabinets for it. Washer Dryer not in unit is something if I have known about to begin with I would have never rented this unit. The bath tub wasn't draining properly off and on during stay. The king bed was comfortable. Front desk was friendly and helpful even though they were not renting this unit. We are sorry that this condo did not meet our guest's expectations. However our description of the property does say that their are "laundry facilities on site" and in another area coin operated washer/dryer" Unfortunatley this was intrepreted to be in the condo. We are adding to our description of Facilities on each floor" - to try to make this more clear to our guests. Dishwashers in this building are far and few between as the building was not originally plumbed for them and the property description does not list a dishwasher in condo. We were unaware of the issues the guest was having with the drain as we did not receive any calls to attend to this during their stay. This issue has since been taken care. We are on call 24/7 to take care of any services issues our guests may have. Great place to stay at the edge of Waikiki! Property was ample space for us, only 2 blocks from Waikiki beach, but situated at the eastern edge of Kuhio so wasn't too noisy (amidst the big hotels). Short walk to Mac 24/7 and Kuhio Beach Park, and short drive to local favorites like Ono's, Halili's, Zippy's, and Leonard's. Management crew was great as well. Thanks! Having been a former resident (kama'aina) of Oahu, I may be a tad picky in reviewing places where I now stay as a tourist. However, even with that being said, this place was great, and the location excellent. My little lady liked Waikiki Beach, and it was a short walk away. She enjoyed shopping along Kalakaua (the main drag in Waikiki),and that, too, was a very short walk away. I liked being so close to Kapahulu Ave., which made for extremely easy coming and going from Waikiki to see other parts of the island. Because of my little lady's fear of heights, we stayed in this relatively low 10th floor unit, knowing other surrounding buildings would be higher. However, none of those taller buildings are all that close to this condo, and there was no feeling of being closed in at all. In fact, while hardly a panoramic view of the ocean, we could easily watch the surfers in the morning from the living room and lanai, and the sunsets were great. This place was quite "comfortable," and made us feel at home. Our (my) only very minor complaint was with all of the fry-pans and other kitchen amenities, there was not even one pot for warming up soup, etc. We left that comment, so perhaps by now, this $10 problem has been rectified. All in all, thought, four thumbs up (two each from the two of us). We HIGHLY recommend this unit and the rental company. This unit has a full set of four pots. We are sorry that this guest did not call us about the pots as we could have helped him locate them. First time as a "condo" renter. (always stayed on a hotel). Parking is a little bit too tight especially if you come in late. Need to clean the furniture cushions (wash or vacuum good! )PAUL, the guy who meet us was the best, makes us feel very welcome. HIGHLY RECOMMENDED!!! Our Housekeeping staff has gone in and done a deep clean of this unit including carpets. Location of property was excellect, everything you need is there. My wife and I went to Oahu in late March 2011, stayed for 9 days at Waikiki Sunset. This was my second time in Oahu, but my wife's first. Location was excellent, we had access to all tourist activities, but we spent most time traveling all over the island. Apartment was perfect, for location, cleanliness, access to major highways and beach fronts. Best thing was having free parking included in rental cost, which was more than competitive for honolulu, with better amenities. Library around the corner, had DVD rentals for $1 per movie, lots of selections. Would highly recommend this location to any traveler, and we plan on staying there again. Last, Captain Cook personnel are helpful, very friendly and accommodating. Thank you. The Captain Cook team is awesome! Their attention to detail and organization is exceotional. They obviously communicate well. The property itself is great - clean, very comfortable and well stocked. This unit may be more appreciated by adults. The Waikiki Sunset does have pool area, but it is in the shade part of the day There is no "kiddie pool" or play space for small children, but there is a tennis court and Bar B Que area. 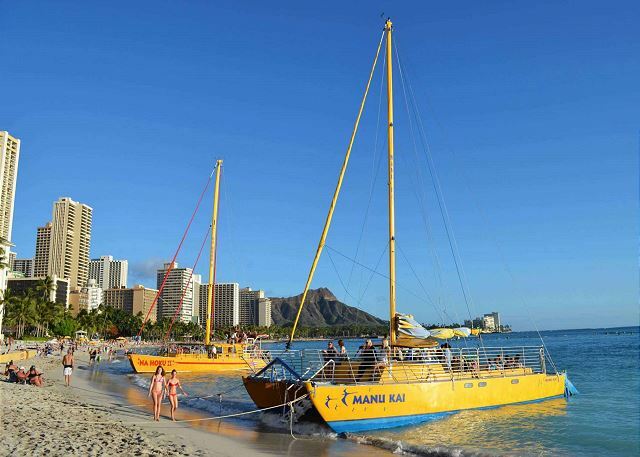 The Waikiki Sunset is an easy walk to restaurants, shops and to the beach. Our contact person ( Barb Sanderson) was wonderful, she provided us with just the perfect accomadation. The propertey manager was so helpful with providing us with Wi-Fi connection. The unit itself is very well appointed and clean. We had a great time in Honolulu and our accomations were extremely good. 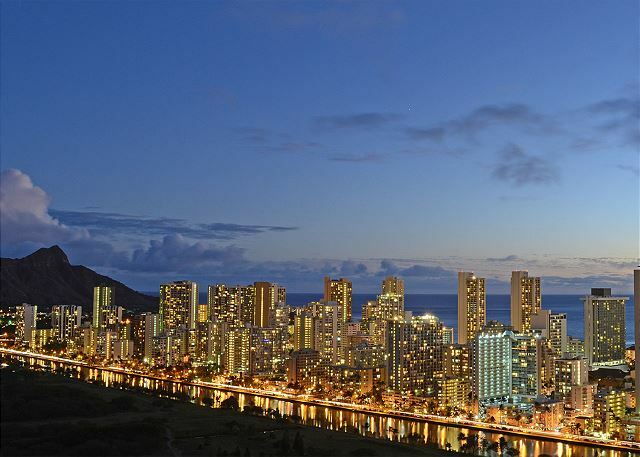 We would definitely wish to come back to Honolulu and stay in Unit 1004 at the Waikiki Sunset.